Posted on Sunday, October 9th, 2011 at 5:00 pm. If you’re in NYC, check out this new play by poet Kelly Zen-Yie Tsai. She, along with Adeeba Rana and Yalinidream, present a thoughtful art performance piece entitled Say You Heard My Echo. This is an evening-length spoken word poetry theater project that juxtaposes fictional narratives of three Asian American women in NYC a decade after 9/11. Their struggles with survivorship and faith prompt them to call on three female religious icons (Mary Magdalene, Guan Yin, and Aisha) for solace and answers as they come of age in a world impacted by war. Rendered with humor and humanity, SAY YOU HEARD MY ECHO questions what remains sacred in times of war while unearthing intersections between feminism, Asian Pacific Islander American identity, and religious freedom. The event is presented on the main stage of the historic Flushing Town Hall in Queens, across from where the Flushing Remonstrance was signed more than 450 years ago, a fundamental document in establishing the religious freedoms enshrined in the US Constitution. 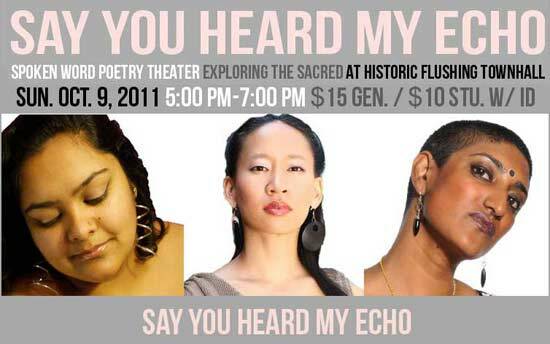 Say You Heard My Echo is a co-production of Asian American Arts Alliance and Flushing Council on the Arts & Culture. Co-sponsored by the Asian / Pacific / American Institute at New York University. Major funding for this event is provided by the Asian Women Giving Circle. Say You Heard My Echo is a commission by the Asian American Arts Alliance for Kelly Zen Yie-Tsai.